Posted on December 15, 2016 at 2:22 pm. Carlin Springs Extended Day program added a new club to its existing activities. 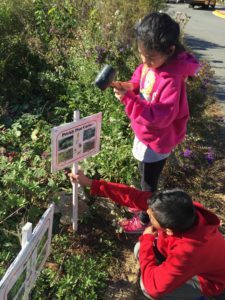 The Garden Club is where kids are free to suggest ideas and then implement them. Last Spring, the students learned that gardening includes not only planting flowers but vegetables as well. They helped take care of the wildflower garden in front of our school. 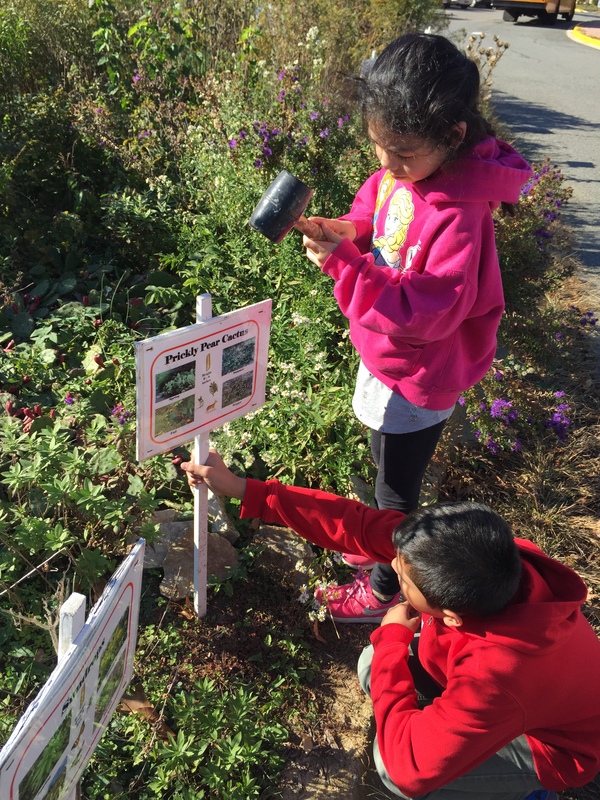 In this garden, the students learned about native wildflowers to Virginia. In addition, they learned that this garden provides food and shelter for animal, birds, and insects. Signs were designed with illustrations of these animals. In 2004, students, parents and master gardeners got together and planned this wildflower garden. Since then, many students and volunteers continue to nurture it. They also created new signs that identifies all the plants that grow there. Williamsburg welcomed a new, four-legged friend to campus this year—Thunder the Therapy Dog! Thunder is a 2 1/2 year old Terrier mix owned by sixth grade counselor Johanna Boyers. 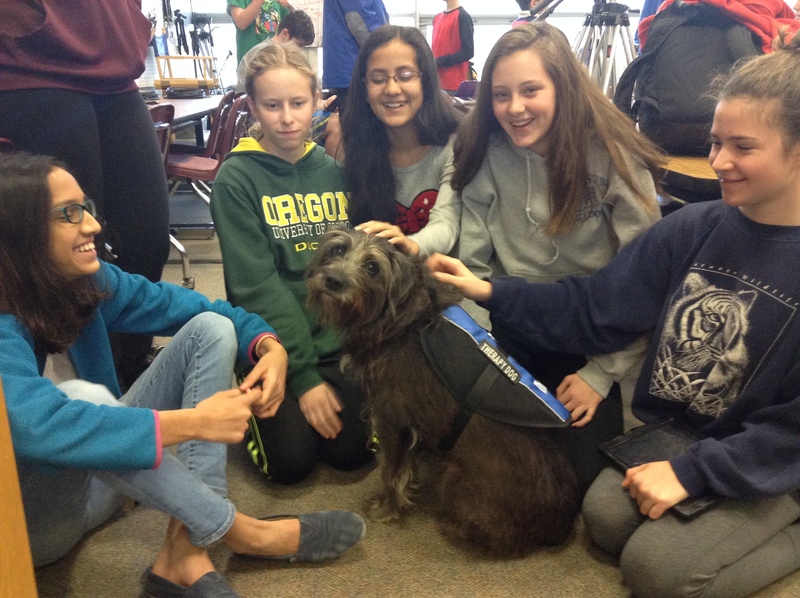 Thunder will come to the school every week and visit with kids throughout the school. Studies have shown that “canine counselors” are extremely effective in reducing stress, encouraging socialization, developing a caring environment, and even complementing educational objectives. For example, Thunder visited with a group of HILT students in November and the kids fell in love. Now, they’re practicing their language skills by writing and reading aloud “Thank You” letters. Teachers and students can request interactions with Thunder throughout the day, and so far his schedule is packed. Lightly butter two slices of bread and tear bread into pieces (1-1 1/2″). Submerge bread pieces in the egg milk mixture pushing down with a fork. Cook in microwave for two min., stopping every 30 seconds. Cool and eat. As a part of its digital citizenship program, Nottingham hosted a viewing and discussion of the movie Screenagers. The film focuses on parenting in the digital age and its impact on children and families. In the discussion, families were encouraged to open up an ongoing dialogue about screen time and to work together to find ways to create balance when it comes to use of digital devices. Students in grades 4 and 5, along with their parents, attended the discussion. The program was organized by Nottingham librarian Nicole Gustafson, counselor Dr. Mary Beth McCormac and the PTA. Arlington Community High School‘s evening World Geography class attended an engaging panel discussion on the new geography of jobs hosted by Arlington Economic Development. Panelists included: Arlington County Board Chair Libby Garvey; Arlington Economic Development director Victor Hoskins; The Urban Alliance director Alessandra Colia; and Hobsons Senior Technical Recruiter/Relationship Manager Susan Van Devanter. Participants discussed Enrico Moretti’s acclaimed book, The New Geography of Jobs. This community opportunity directly linked to the class SOL objectives on evaluating resource distribution, and comparing and contrasting characteristics of population. 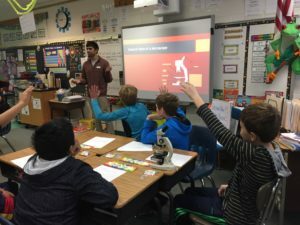 Additional benefits for the students included exposure to an analytical discussion of turning, “those theories into thriving economic growth,” in their own community of Arlington. 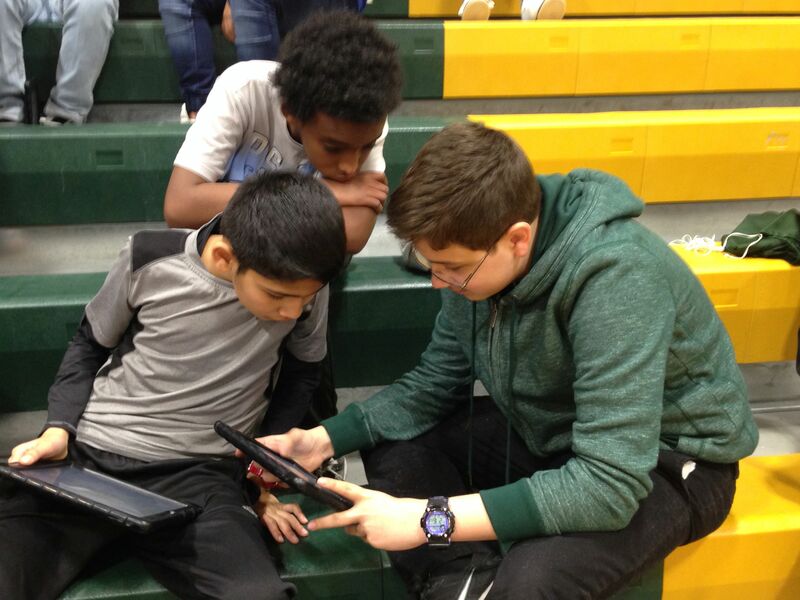 In recognition of the hour of coding, Kenmore’s business and information technology teacher Jureen Benjamin coordinated several hour of coding activities during the week. Twenty of her Computer Science students traveled to the Career Center to help with the APS evening of coding. On Dec. 5, a school-wide announcement on the TV news was made to encourage all students to code throughout the week. On Dec. 6, Computer Science students hosted a Coding Café at lunch where students could come with their iPads and spend time coding. Finally, on Dec. 8, Computer Science students led students through coding activities in fitness classes throughout the day. On Dec. 1, Wakefield participated in a 2nd Annual STEM Festival at DC Convention Center. Students took the opportunity to learn about radio frequency spectrum, radar transmissions and cyber vulnerabilities through a series of interactive stations. Students also engaged in conversations with several engineers from Raytheon and BAE Systems Inc. for their Senior Project topics. Finally, students obtained valuable information from college representatives about their STEM programs. Engineering and Computer Science students were inspired and informed on the latest technology US Military is using to protect our country and the fight against terrorism. On Fri, Dec. 9, 23 H-B Woodlawn students participated in the Student Songwriting Festival. 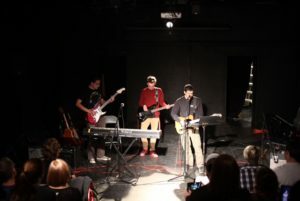 The students represented six different APS secondary schools. All but two of the students were grouped with people they had just met minutes prior to the performances. The Swanson Writers Project, which started this year, is a robust effort to cultivate kids’ curiosity, creativity, and academic achievement by regularly bringing acclaimed authors and writers from all walks of life for school and classroom visits. In support of the 40 Book Challenge and igniting book love in us all, since the beginning of the year students at Swanson have had six opportunities to attend a presentation, either via Skype or in person, by a real life author. Abingdon students decided that an hour of code was simply not enough! 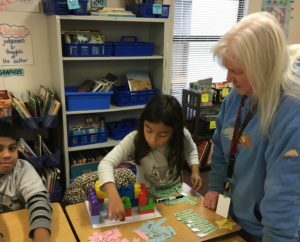 Working with the technology team of Kerry Abbott, Jackie Firster, and Cassidy Nolen, students in grades K-1 had three hours of code, while students in grades 2-5 engaged in nine hours of code. While many of the coding projects used online apps, students also took the low-tech approach, using Legos to create elaborate 3-D mazes in which to navigate avatars. Working in pairs, students wrote and sequenced the code, directing the Lego robots around the walls and over the blockades of the mazes. Once completed, groups tried out other mazes to check for coding glitches. The art team of Lauren Muscarella and Robyn Megonigal helped facilitate this coding project. 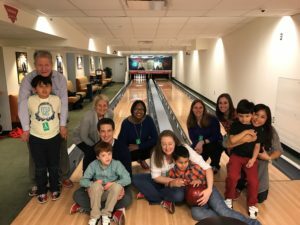 On Dec. 8, the MIPA class at Jamestown went bowling at the White House. The students were greeted by Secret Service and led to the Truman Bowling Alley, where they enjoyed a couple hours of fun. In preparation of the trip, the class learned about the significance of the the White House, President Barack Obama, and practiced bowling in the classroom. Henry counselor Erin Upton coordinated the first of several “Career Cafés” with special guest visitor and parent, Tanya Dobrzynski a deputy budget director for the National Oceanic and Atmospheric Administration (NOAA). 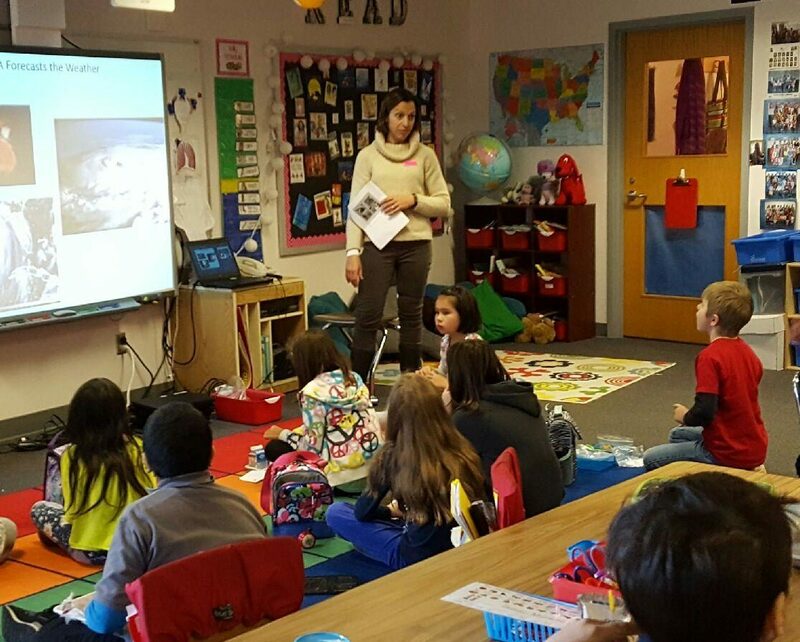 Dobrzynski presented in Megan Zelasko’s first grade classroom about numerous activities such as protecting endangered ocean animals as well as forecasting the weather and researching the impacts of climate change. 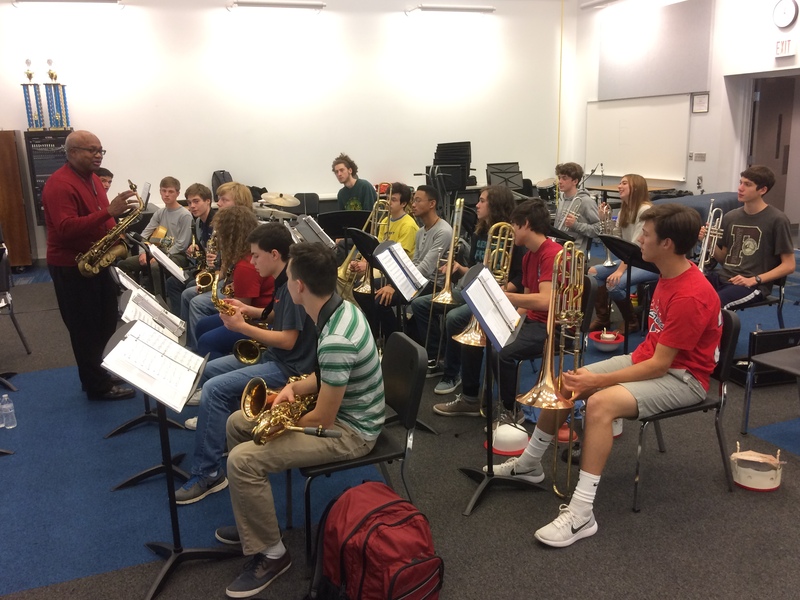 Forty sophomores in Wakefield’s Cohort program visited Georgetown University on Tue, Dec 6. Rosie O’Neil, staff member at Georgetown and the parent of a Cohort alumni, welcomed the group and gave a campus tour. Three former Wakefield graduates currently attending Georgetown, one a Cohort alum and the other two former members of our United Minority Girls program, served on a student panel discussing the transition from high school to college and answering questions from the boys. Staff who accompanied included College and Career counselor John Clisham and Cohort Sophomore co-sponsors Ivan Lopez, Wendy Maitland and Alan Beitler. Last week, National Science Foundation scientists visited with Barrett fifth graders and brought nematodes for them to observe under microscopes. Lots of fun and learning took place and students were completely mesmerized! 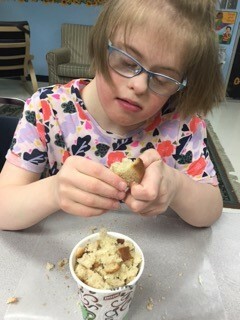 The experience was provided as part of Barrett’s partnership with the RESET organization. 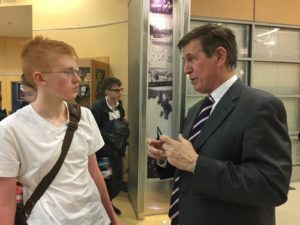 W-L social studies teachers Jeffrey McCarthy, Peter Vogel, Margaret East, Nitza Lord, Jarrod Hills, and Mary Jo Primosch hosted a visit from Congressman Don Beyer on Dec. 9. The Congressman spoke to Washington-Lee senior government students about the challenges of working in Congress, but also about the possibility of affecting change through legislation. After brief opening remarks, Congressman Beyer fielded questions from the students.